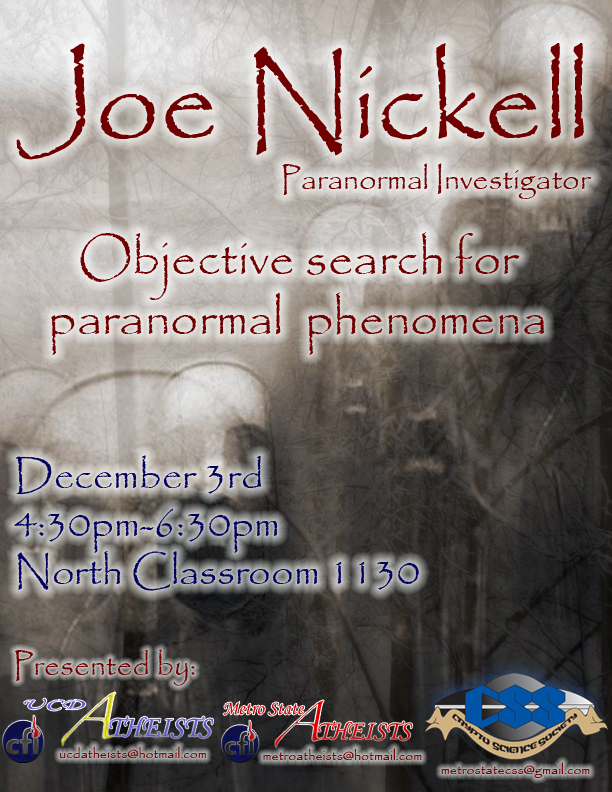 Joe Nickell has investigated nearly all fringe-science and paranormal type claims. After 40 years he hasn’t found anything—yet. This is the approach he has taken and continues to take into investigations. This was the central point of his talk at UCD/Metro State on December 3, 2009. The event had a fair attendance given the school’s advertising policy and restrictions. 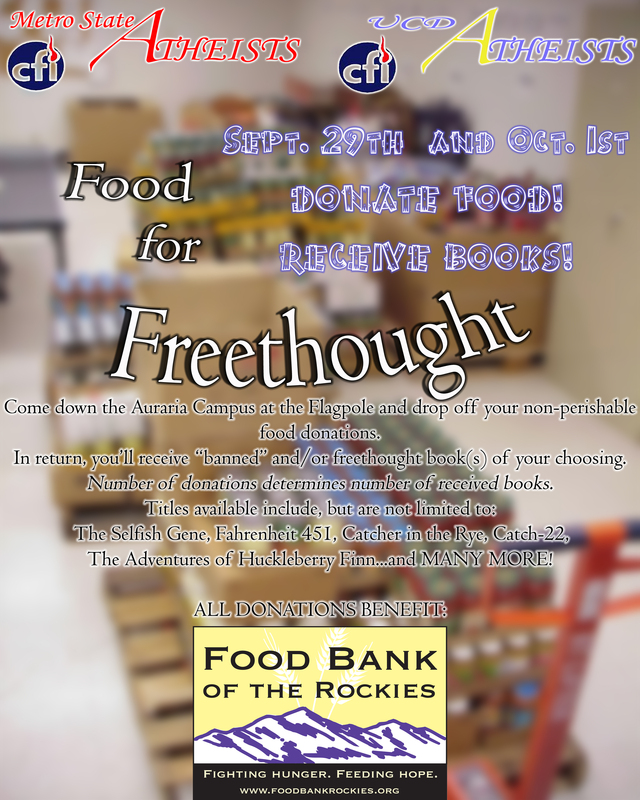 The Metro State Crypto Science Society co-sponsored the event with Metro State/UCD Atheists. They brought many of their members to listen to Joe’s approach and philosophy. However, if they were there to hear about groundbreaking evidence that ghosts, orbs or paranormal energy existed or had a shred of scientifically credibility, they were disappointed. However, they weren’t there for that. They were there with an open-mind, there to be challenged by the skeptics (which made up most of the audience). There were there, also, to see what methodology the only full-time paranormal investigator uses and what his findings have been. Joe’s talk was nothing short of spectacular. His explanations of his method’s and philosophy about investigations would leave only the most ardent believer to criticize his neutrality. He said the best was to investigate claims isn’t to go into it with a preconception, a mistake he says is often made by skeptic and believer alike. Though, after 40 years of investigations, Joe told his secret of objectivity to audience; willful suspension of disbelief. Of course, in the case of the believer this would be the willful suspension of belief. Whatever the case, Joe showed several examples of his work that captivated the audience. The examples he presented ranged from ghosts to cattle mutilation and spontaneous human combustion. All topics invested by the Metro State Crypto Science Society. In all, the event was fantastic. The event was capped with a long, engaging and informative question/answer session in which some interesting topics not discussed during his talk came up including Therapeutic Touch (TT), which was easily answered by resident TT expert and UCD student Emily Rosa, who was in attendance. If you don’t know, Emily Rosa holds the Guinness World Record for being the youngest person to have research published in a major medical journal. The research she did was done at 9 years old on TT. Joe also made it point, during the Q&A, to teach skeptics how to handle claims of the paranormal in a more productive and respectful manner. Joe did do two radio interviews while in Colorado. The first was done with Rational Alchemy, with guest co-host Joel Guttormson (President of Metro State Atheists). The second was done with a group called Rocky Mountain Paranormal ( a local skeptics group with a podcast). Joel Guttormson is an undergraduate at Metropolitan State College of Denver. He is currently double-majoring in Theoretical Mathematics and Linguistics. 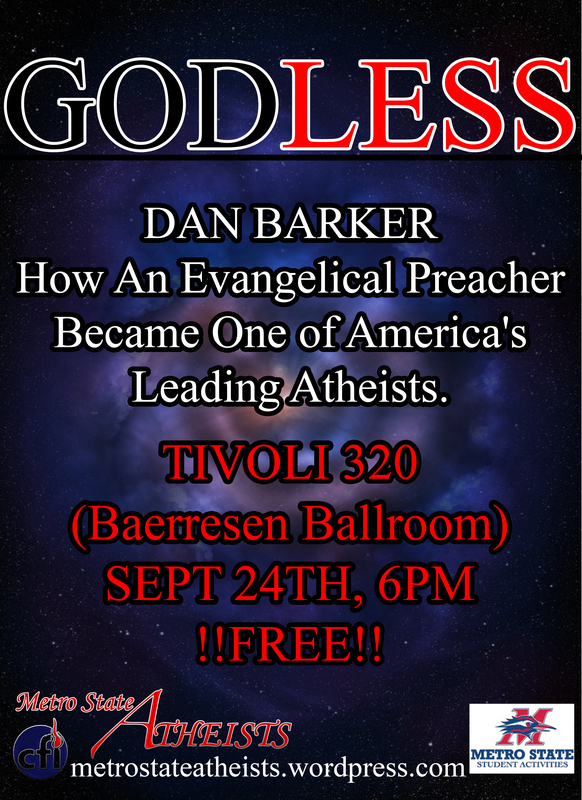 He is President of Metro State Atheists and volunteers for the CFI as an On-Campus Regional Coordinator and as a member of the Publications and Activism Committees. GO TO http://skepticon.org/contribute/donate.php AND DONATE!!!! As promised to donors during our Haitian Relief Effort fundraiser on January 20, 2010, below is posted the receipt for the donation to S.H.A.R.E. We raised a total of $250, all of which was donated to S.H.A.R.E. full amount can be claimed as a charitable contribution. 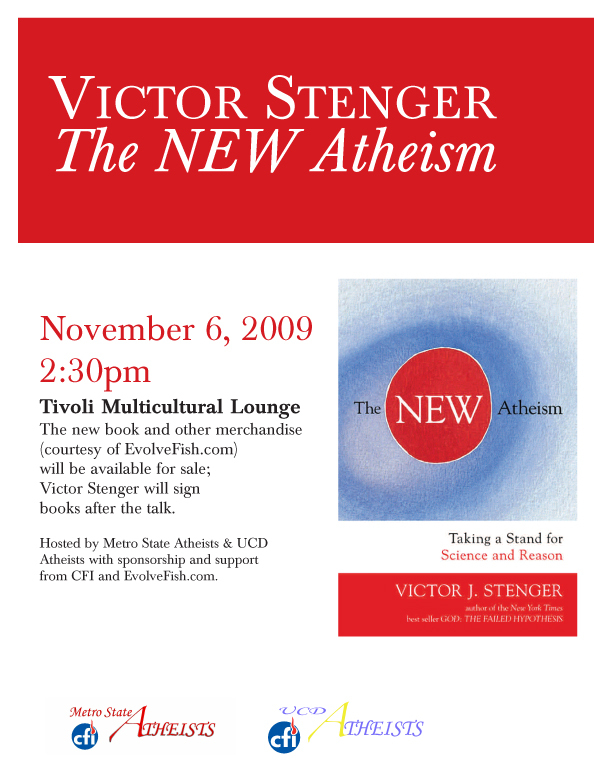 Victor Stenger-“The NEW Atheism” Nov. 6, 2009!!! 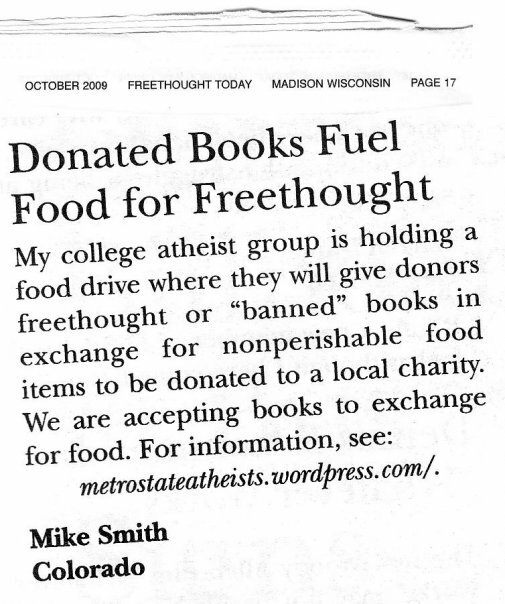 Freethought Today mentions Food for Freethought!